…are how Bogud Numidia sees. …are portals to a Far and Sunless Land. Water Lily(The Key of Something Spiritual): Bogud Numidia came from the Outside, from the Lands Beyond, from a Far and Sunless Land, to bring about the dissolution of the Lie. In her eyes she carried Truth, and all eyes would be her eyes, and the world would be stripped bare of the Lies… and all things, knowing what they must know, would go willingly back to the Not. This was her purpose, she was the Saint of Truth, a Bodhisattva dedicated to Banishing Mara, as all Bodhisattva’s sought to do. Bilberry(The Key of the Fallen): When she looked upon Creation for the first time and made ready to unmake it, Bogud Numidia was struck by a harsh and unwanted truth. People, entities, souls, beings… they were Real. The mantra of the Deceivers is that in a Far and Sunless Land there is a True Thing, and all of the world is a Lie. But the eyes of Bogud Numidia saw that this was not the case, that the world held it’s own Truths. And in this way she was broken, a fallen bodhisattva whose path was no longer clear. Bogud Numidia is torn. Every thing she looks at in the world she disapproves of, but she also acknowledges the people of the world. Those people that she disapproves of so… they are real. She is locked in a glass box of emotions. Bogud Numidia’s eyes show are a way of seeing the world. They show you things you didn’t want to know and serve as doors to places strange and alien. They belong to Bogud Numidia. To become the Eyes of Bogud Numidia is to become a part of her, to experience the world as she does. Bogud Numidia was born, adrift, in a sea of lies. She is self-created out of deception, a spontaneously generated beacon against untruth. To think she was ever less than that — a girl whose whole terrible world was upended and revealed as comforting fiction — is foolish hoping. 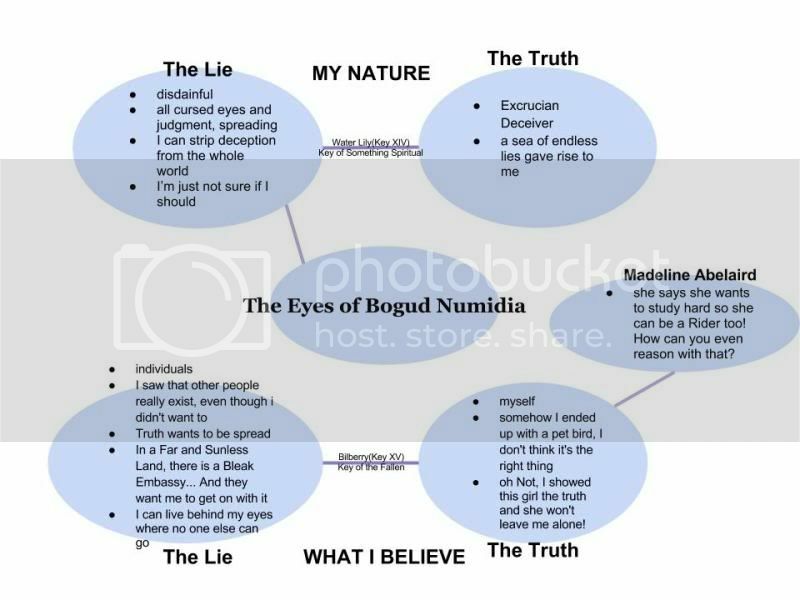 Bogud Numidia is on a mission of truth, trying to enlighten individuals to reality’s true nature with her eyes. She is trying to share her vision with those who can help spread the word. She shares her eyes with mortals… but the Powers and Imperators are her true targets. Bogud has an ace up her sleeve, though she is not sure if she has the will to use it. With an act of will, she can open the eyes of all of the world at once. As the sun becomes a sucking hole to a Far and Sunless Land, the mortals of the Prosaic World, unprepared for unexpected revelation, will shatter, dementia animus consuming them even as the world is consumed. It’s… It’s a scary plan. Bogud Numidia has a pet bird, Slalom Ophanim, whose eyes are her eyes. It is intelligent, though not very. She’s not at all sure how she ended up with it (she disapproves of birds, obviously)… or why she keeps it, but she does. Bogud thought the bird was bad? Having given seventeen year-old Philosophy major Madeline Abelaird of Des Moines, Iowa a taste of Truth, Bogud now finds herself seemingly unable to rid herself of the young woman. Madeleine says she is going to study hard so that she can grow up to be a Rider like Bogud. Bogud can’t even begin to form the thoughts necessary to explain what is wrong with that idea. In a Far and Sunless Land there is a Bleak Embassy. The Ambassadors of the Bleak Embassy look upon Bogud Numidia as a rogue element. She should have done what she was expected to do, by now. She should have shown the world the Truth (all consuming madness or not) and then sat back and waited for it to simply dissolve away. That she hasn’t is… disturbing. The Eyes of Bogud Numidia are a portal to the Outside and through that Portal Bogud can reach a place of falling stars and glass that she alone calls home. I’m Going to Break the World… If I have to I Guess? I think it’s clear by this point that Bogud is deeply conflicted about her role as a Deceiver. At this point, she’s leaning more towards destroying the world than not doing so… but only just. And only in the most humane way possible. For every 2 MP that Chu Mei Tupia Osorio loses (note, no Gifts cost MP for her, though Strike would), Chu Mei Tupia Orsio loses one of her arms, and with it one of her gifts. This applies only to her MP, so the PMP of the Deceiver is safe enough to spend. …is manipulation in real time. …reconfigures the bland into the incredible. …is a good way to pass the time. This technique affects a thousand freshly made paper cranes (make them yourself), and beseeches a single wish of them. They will make it so, as an Imperial Miracle. This is extremely powerful, but unpredictable in length of time and how they shall interpret the wish. Makes a paper object impossibly strong and durable.